Original Soul Vegetarian has been serving delicious vegan soul food before “being vegan” was even a thing in Chicago. For thirty-three years we’ve been pioneering and providing vegan meals and beverages here on the South Side. What, you might ask, does being vegan truly mean? Although vegetarianism and veganism have gotten lots of media attention and become vogue, many people don’t know the difference. 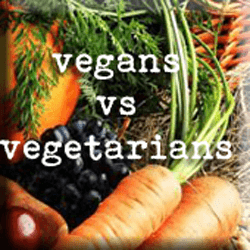 So what does it really mean to be vegetarian versus vegan? Vegetarians don’t eat meat, poultry, fish, or seafood. Vegans, on the other, hand don’t consume or use any animal products or by-products. So in addition to not eating meat, poultry, fish, or seafood, vegans also refrain from dairy and, often, honey as well. Why do people choose vegetarianism or veganism? Some people eat vegetarian or vegan for health reasons (reducing the risk of diabetes, cardiovascular disease, cancers, etc). Others make the decision to be vegan for dietary reasons (most of the population cannot digest milk and many people have intolerances and/or allergies to dairy). Still other people make the decision for ethical or religious reasons (believing that veganism is compassionate and humane, environmentally friendly, or in accordance with their personal religious doctrine). Despite what many meat-eaters might say, you can get all the nutrients and vitamins that you need to live a healthy, productive life as a vegan or vegetarian. Considering veganism? Check in tomorrow for five reasons to go vegan.